God meant for this mysterious book to be understood! Here is how. The Book of Revelation was given as a mysterious, closed and sealed book. It was sealed with seven seals. It is similar to the book of Daniel, which God told Daniel was sealed until the time of the end. But if God wanted to hide this knowledge completely, He never would have revealed it in the first place. He meant for those seals to be opened. In fact, God intended this important prophetic book to be understood in our time today! The question is, when would those seals be opened, and what would the book reveal? Revelation tells us that Jesus Christ would be able to open those seals. “And I wept much, because no man was found worthy to open and to read the book, neither to look thereon. And one of the elders saith unto me, Weep not: behold, the Lion of the tribe of Judah, the Root of David, hath prevailed to open the book, and to loose the seven seals thereof” (Revelation 5:4-5). Christ is the one who can show us all this revelation that has been sealed. He alone can do so. But what does it mean that He “prevailed to open the book”? It shows that loosing these mighty seals was not a simple matter. In order to reveal this prophecy, Christ had a titanic battle with Satan the devil, and He won. He qualified to replace Satan on his throne, and now He—and only He—is qualified to open those seals. Christ has loosed those seals—but He didn’t do so in the book of Revelation itself. I want to show you something Christ said that most people do not understand. We will look at one chapter of the Bible to see how that chapter alone unseals those seven seals. Jesus delivered a pivotal prophecy—one of the longest single prophecies in the Bible and the most important prophecy Christ revealed when He was on this Earth. He spoke this prophecy after He had prevailed in that battle with Satan and qualified to reveal it. It is called the Olivet prophecy. It is recorded in the Gospels of Matthew, Mark and Luke. I will just focus on the account in Matthew 24, and show how it looses the seals on the prophecies of Revelation. All prophecy, in a sense, revolves around Matthew 24. In this chapter, Christ prophesied about a volcanic eruption of crises on Earth that has never been experienced—and about the birth of a new age that will come from it. Jesus Christ has prevailed and has revealed this, and we are now seeing these prophecies being fulfilled. The seven seals form the story flow of the book of Revelation. Here is the overview: The first seal reveals false prophets; the second, war; the third, famine; the fourth, pestilence; the fifth, tribulation; the sixth, heavenly signs; and the seventh, seven trumpets. If you understand those seals, they lead you step by step to the return of Jesus Christ: He returns at the last of those seven final trumpet blasts. So the Second Coming concludes those seven seals. That makes this prophecy—even though it has a lot of bad news—the most exciting, wonderful news imaginable! The first seal Christ opens reveals the first horseman of the apocalypse. The first four seals reveal a total of four horsemen. “And I saw when the Lamb opened one of the seals, and I heard, as it were the noise of thunder, one of the four beasts saying, Come and see. And I saw, and behold a white horse: and he that sat on him had a bow; and a crown was given unto him: and he went forth conquering, and to conquer” (Revelation 6:1-2). Christians usually assume this horseman is Jesus Christ because Christ also comes on a white horse. But Christ comes with a sword, not with a bow (Revelation 19:11-15). And when you see what this white horseman actually does, you realize that even though he looks like Christ, it isn’t Christ at all! This is a false Christ who has deceived the world—the Christian world and the non-religious—about the prophecies of Revelation! Christ unseals and explains this to us in Matthew 24. “And as he sat upon the mount of Olives, the disciples came unto him privately, saying, Tell us, when shall these things be? and what shall be the sign of thy coming, and of the end of the world [or age]?” (verse 3). If you read through the chapter, you see that the main sign is the gospel being preached around the world (verse 14). Christ was saying that His true gospel message would not be preached—but then, right before the end, it would be. That commission being completed would mark the world’s entering into the very last end. That was the main sign Christ gave, but there are others here. The very first thing Christ said was this: “Take heed that no man deceive you. For many shall come in my name, saying, I am Christ; and shall deceive many” (verses 4-5). Here, then, is the meaning of the first seal in Revelation, the first horseman of the apocalypse. 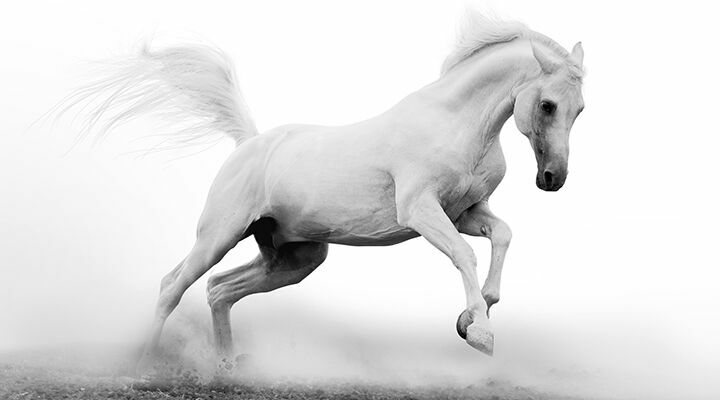 This is what Christ revealed: It is the white horseman of religious deception. This horseman proclaims a lying message about Christ. This false religion proclaims that Christ was the Messiah, but it is deceiving people about what He said! This horseman comes first because he causes the most suffering by far. He is a false teacher of Christ’s message, one who “went forth conquering, and to conquer.” This deceitful ministry conquers by deceiving, and it has deceived the whole world (Revelation 12:9). This is the deadliest of all the horsemen. Here is what Revelation says about the second seal: “And there went out another horse that was red: and power was given to him that sat thereon to take peace from the earth, and that they should kill one another: and there was given unto him a great sword” (Revelation 6:4). The second seal reveals the horseman of war. What did Christ say about this in the Olivet prophecy? “And ye shall hear of wars and rumours of wars: see that ye be not troubled: for all these things must come to pass, but the end is not yet” (Matthew 24:6). There will be all kinds of wars from the first coming of Christ to the Second Coming—but those right at the very end before His Second Coming will be about 100 times worse than any ever on this planet! That is what Christ is telling us. This is the same period that the Prophet Daniel called “the time of the end”—or as the Moffatt Bible translates it, “the crisis at the close.” It is the worst crisis ever on this Earth! We ought to take note because it is already beginning to unfold before our eyes. Look at all the countries that have nuclear bombs and are ready to detonate them. Once you start a nuclear war, you can’t really stop it. The third seal is described in verses 5-6: “And when he had opened the third seal, I heard the third beast say, Come and see. And I beheld, and lo a black horse; and he that sat on him had a pair of balances in his hand. And I heard a voice in the midst of the four beasts say, A measure of wheat for a penny, and three measures of barley for a penny; and see thou hurt not the oil and the wine.” Seal number three reveals the horseman of famine. “And I looked, and behold a pale horse: and his name that sat on him was Death, and Hell,” or the grave, “followed with him. And power was given unto them over the fourth part of the earth, to kill with sword, and with hunger, and with death, and with the beasts of the earth” (verse 7). The fourth of these seven seals is the horseman of death. Christ’s prophecy in Matthew 24 goes on to explain these next two seals. “For nation shall rise against nation, and kingdom against kingdom: and there shall be famines, and pestilences, and earthquakes, in divers places” (Matthew 24:7). There are the third and fourth seals: famine and pestilence, and all the death that will result worldwide. “All these are the beginning of sorrows,” Christ warned (verse 8). These are the conditions and events Jesus Christ said to look for right before His return! Verses 9-11 of Revelation 6 describe the next of these seven seals. This passage begins, “And when he had opened the fifth seal, I saw under the altar the souls of them, that were slain for the word of God …” (Revelation 6:9). This is discussing God’s own people—people who knew God and the true gospel—being killed. Notice how Christ describes this same prophetic event in Matthew 24:9: “Then shall they deliver you up to be afflicted, and shall kill you: and ye shall be hated of all nations for my name’s sake.” Christ aimed this directly at “you”—His own disciples. This is a world-shaking event! This seal is describing the Great Tribulation, a 2½-year period of Satan’s great wrath (Revelation 12:12). This isn’t the time of the wrath of God—that one-year “Day of the Lord” comes right after the Tribulation, making a total of 3½ years of unprecedented suffering before Jesus Christ returns (Revelation 11:2-3; 13:5; Daniel 12:7). Why were these saints killed during the Tribulation? Several times in Scripture God promises to protect His people during that period (e.g. Revelation 12:6). Why didn’t these saints receive God’s protection? Other scriptures reveal the answer. The last era of God’s Church before Christ returns is described in Revelation 3:14-22. Christ chastens it for being lukewarm and spiritually wretched. The large majority of God’s people today have fallen into that condition. That is a shameful truth. These people who have known God but turned away are not going to be protected by Him! God will allow them to experience the nightmares of the Tribulation because they were lukewarm and not excited about the Second Coming of Jesus Christ to stop all these crises forever! God says that this is what it will take for them to turn back to Him so that He can get them into the Kingdom of God, into His Family. You can read more about this in our free book Malachi’s Message. Those lukewarm saints are going to be killed during the Great Tribulation. But those who have known God and clung to Him—the very elect—will be protected. “And then shall many be offended, and shall betray one another, and shall hate one another. And many false prophets shall rise, and shall deceive many” (verses 10-11). The Greek word translated many means that most of God’s own people will be deceived! That is what Christ prophesied—and that is exactly what has happened in this end time. Ninety-five percent of God’s Church has been deceived. That proves we have to work very hard not to be deceived. We can be deceived so easily. “And because iniquity [lawlessness] shall abound, the love of many shall wax cold” (verse 12). This “love” is the agape love of God, which comes from His Holy Spirit (e.g. Romans 5:5; Galatians 5:22). Only the people of God, who possess the Holy Spirit, have that love, and here Christ prophesied that this love would “wax cold” in many of these people! They had it but they are losing it. Why? Because of lawlessness. This is still in that fifth seal, the Great Tribulation. This prophecy has been fulfilled! Do you know that the true gospel of God, after being suppressed for centuries, was in fact preached around the world for a witness to all nations? Do you know who did that job? These questions are also answered in Malachi’s Message. But which “end” comes after that commission is finished? It is different from the “end of the world” in verse 3, from the Greek synteleia. This is the Greek word telos. Thayer’s Lexicon explains that the context has to tell you what “end” it is. This is speaking of the end of the gospel being preached around the world—after which we will enter into the time when all of these terrible events of Matthew 24 will unfold. This is the “last end” spoken of in Daniel 8:19. Christ has unsealed this for us. We should understand it! What did He say would happen next? “When ye therefore shall see the abomination of desolation, spoken of by Daniel the prophet, stand in the holy place, (whoso readeth, let him understand:)” (Matthew 24:15). What is this? Luke 21:20 describes this “abomination” as “Jerusalem compassed with armies.” Other prophecies show that these armies belong to a reconstituted Holy Roman Empire in Europe! They also reveal that this “abomination that maketh desolate” (Daniel 12:11) will rise up just before the modern-day nations of Israel—which include the United States and Britain—collapse! That might have seemed far off when Herbert W. Armstrong first prophesied about Matthew 24, but now we can see it happening! The verses that follow are about the faithful people of God fleeing destruction—fleeing to a place of protection that God will provide. This is more proof that God will in fact protect some. And here is what He will protect them from: “For then shall be great tribulation, such as was not since the beginning of the world to this time, no, nor ever shall be. And except those days should be shortened, there should no flesh be saved: but for the elect’s sake those days shall be shortened” (Matthew 24:21-22). This is Christ’s prophecy of horrors unprecedented in human history—besieging the world right at the end. He said that unless He intervened, mankind would wipe itself completely off the face of the Earth! Since that time, we have developed chemical and biological weapons. We can exterminate ourselves many times over! The number one problem we face is human extermination! That has never been possible in history until very recent times. We are now in exactly the position Jesus Christ prophesied about in Revelation and Matthew 24! This is the crisis at the close! More people should see that. More ministers should be talking about that. There is no excuse: There are prophecies throughout the Bible that tell us that—over a hundred of them! The end of all things is “at the doors” (verses 32-33). In verse 41 we again see God’s Church divided between those who cling to Him and do His work, and those who are lukewarm. Both churches are in the field, working away, but only one of them is going to be taken and protected—and the other is going to be left. Ninety-five percent of God’s people are not going to be protected. But because they don’t look to Christ’s prophecies, they won’t realize it. All these horrors are going to spring on them like a steel trap! In Luke 21:34-36, Jesus warned that you had better watch for these prophecies. Watch world news, but also watch your own spiritual life so you don’t fail to see what is happening. The sixth seal reveals mighty heavenly signs: “And I beheld when he had opened the sixth seal, and, lo, there was a great earthquake; and the sun became black as sackcloth of hair, and the moon became as blood; And the stars of heaven fell unto the earth, even as a fig tree casteth her untimely figs, when she is shaken of a mighty wind” (Revelation 6:12-13). These signs are an indication of the fearsome things about to come next. Christ explains this sixth seal in Matthew 24:29: “Immediately after the tribulation of those days [which was the fifth seal] shall the sun be darkened, and the moon shall not give her light, and the stars shall fall from heaven, and the powers of the heavens shall be shaken.” Those are the same heavenly signs. You can also read them prophesied in Joel 2:31: “The sun shall be turned into darkness, and the moon into blood, before the great and the terrible day of the Lord come.” This confirms that these signs mark the end of the Tribulation—the 2½ years of Satan’s wrath—and signal the beginning of the Day of the Lord—the year of God’s wrath. These are world-shaking events. And just as Jesus’s other prophecies have come to pass, so too will these! Revelation 6:17 introduces the seventh seal: “For the great day of his wrath is come; and who shall be able to stand?” That seventh seal is spoken of in Revelation 8 and 9. It consists of those seven trumpets. Here is where Christ explained the seventh seal: “And he shall send his angels with a great sound of a trumpet, and they shall gather together his elect from the four winds, from one end of heaven to the other” (Matthew 24:31). That seventh seal includes seven trumpet plagues that God pours out on mankind. There are only a handful of scriptures about the Great Tribulation in Matthew 24 and Revelation, but there are over 30 about the Day of the Lord, which is the day of God’s wrath on this Earth. Joel says the Day of the Lord is at hand, as destruction from the Almighty. God is sick of mankind’s sin and lawlessness, which plunges us into the greatest crisis ever. The world has never seen anything like the wrath of God that it is about to see! Yet sadly, throughout these plagues, mankind will refuse to repent. How does all this end? At the last trumpet, Jesus Christ Himself is going to return to this Earth! “The kingdoms of this world are become the kingdoms of our Lord …” (Revelation 11:15). Jesus Christ is about to take over this world in crisis, rule it with a rod of iron and bring peace, joy, happiness and success to everybody on Earth. That is the kind of prosperity mankind really wants, but has never been able to achieve. If you are willing to look into God’s Word with an open mind, you will see that all Christ talked about 2,000 years ago is coming to pass—the bad news and the good!